Image credit: © D. Haring/Duke Lemur Center. All rights reserved. Pelage: Marked difference in the appearance of males and females. Males overall black in color; females with a creamy-white to gray belly and golden-orange to reddish-tan back. Range: Limited to a small region within northwestern Madagascar on the Sahamalaza Peninsula and adjacent mainland. Population in Wild: c. 2,780-6,950 individuals. Among the 25 most threatened primates in the world (in 2014). Locomotion: Move rapidly on all four limbs through trees. Leap to cross gaps in the forest canopy. Activity Cycle: Active at day and during portions of the night. Peak activity typically near dawn and dusk. Social Groups: Live in multi-male, multi-female groups. Core groups include 1-2 adult females, accompanied by 1-2 subadult females. Males are typically transient. Diet: Vegetarian; animals primarily eat fruit and leaves from a wide variety of plants. Predators: Fossa, Henst's Goshawk, Madagascar Harrier-hawk, Malagasy Ground Boa, Nile Crocodile, and humans. Sexual Maturity: Females first reproduce c. 3 years of age. Longevity: Typical lifespan in the wild not known. In managed care, animals often survive 20 or more years. Maximum longevity 32 years, a female housed in a European zoological facility. Pronounced differences in the appearance of males and females initially led to the two sexes being designated as separate species. Following initial descriptions of these striking lemurs in the late 1800s, little to no reports of the animals appeared until the 1980s when the nearly "mythical" animal was rediscovered by a joint French and Malagasy expedition in northwestern Madagascar. The only non-human primate with blue eyes, a feature common to both males and females. Lives in small social groups. Female fidelity to a group is common and they are dominant to the more loosely associated males. Destruction of their forest homes as well as exploitation by humans has driven severe declines in their numbers. In 2014, the critically endangered blue-eyed black lemur was listed among the 25 most endangered primates in the world. © 2015-2018 San Diego Zoo Global. Updated Aug 2018. 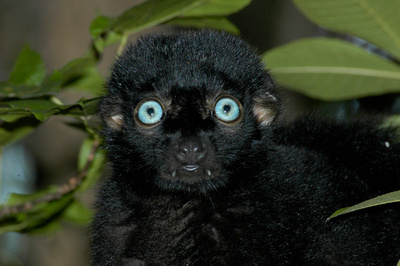 How to cite: Blue-eyed black lemur (Eulemur flavifrons) Fact Sheet. c2015. San Diego (CA): San Diego Zoo Global; [accessed YYYY Mmm dd]. http://ielc.libguides.com/sdzg/factsheets/ blue-eyed_black_lemur. We wish to thank Guy Randriatahina for providing expert content review of this fact sheet. Mr. Randriatahina is among the first researchers to have worked with the blue-eyed black lemur in their natural habitat. He has served as the country representative of the AEECL (European Zoos for lemur study and conservation) since 2008.